Brazil’s ‘chainsaw queen’ takes on environmentalists | S.A.F.E. Outside the political hothouse of Brasilia, there are probably few who can name the head of Brazil‘s powerful agricultural lobby, yet the woman in question, Kátia Abreu, is rapidly becoming the country’s most interesting, important – and dangerous – politician. The senator and rancher from Goiás was an influential force in the weakening of Brazil’s forest code blamed by many for the recent rise in Amazon deforestation. 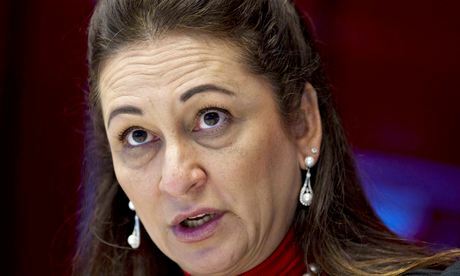 Her support – in parliament and in an acerbic newspaper column – for more roads through the Amazon, congressional control over demarcation of indigenous reserves, more efficient monocultures and genetically modified “terminator seeds” has earned her the wrath of environmentalists who have called her “Miss Deforestation”, “chainsaw queen” and the “face of evil”. A psychology graduate who took over a ranch after her husband died in 1987, Abreu has become the staunchest defender of agribusiness in Brazil. She heads the Confederation of Agriculture and Livestock and leads its political lobby, which claims more than 250 senators and members of congress. Her bullish business message is underpinned by flag-waving nationalism and attacks on any group accused of trying to slow the growth of Brazilian agriculture. This include environmentalists, indigenous groups and landless peasants, all of whom she alleged – without evidence – were working for foreign interests. “I don’t have concrete proof of this but I get a very strong impression that this is the case,” she said. Abreu’s uncompromising rhetoric and style are reminiscent of Margaret Thatcher. When I mention the comparison, the congresswoman lights up. Like Thatcher in the 1980s, Abreu is engaged in a potentially world-changing struggle. While the British prime minister’s battle against the miners in the 1980s ushered in a period of social division and runaway capitalism, Abreu is taking on the environmental movement with enormous potential consequences for the global climate and food supply. She appears to be winning. As the economy has become more dependent on agribusiness, the influence of its lobby in parliament has increased to the point where it can almost make or break the government agenda. The situation looked very different a decade ago, when former environment minister Marina Silva introduced a series of measures that slowed deforestation and promised more territory for indigenous groups and landless peasants. In the presidential election in October, Abreu said she would back the incumbent, Dilma Rousseff, whom she described as “more interested in agriculture” than her predecessor, Luiz Inácio Lula da Silva. That is likely to mean further erosion of indigenous rights, weaker environmental laws and loser restrictions on genetically modified terminator seeds – all of which are currently being pushed in congress by Abreu’s lobby. “We cannot rest on our laurels. There are many things holding back progress – the environmental issue, the Indian issue and more. But even with these problems we keep producing high levels of productivity. Imagine how high it might be without those obstacles,” she said.